Scotland is the de facto king of whisky. But now an unlikely challenger — Japan — is making a name for its whiskey far beyond its borders. 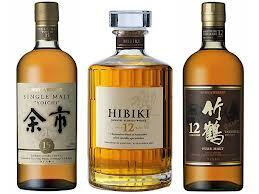 Unfortunately for Americans, this highly coveted Japanese whiskey is very hard to come by. “I stock everything that’s currently available,” says Eddie Kim, beverage director at the Japanese in Washington, D.C. “I’d take more [Japanese whiskey] if it was out there.” Currently, he has on hand two and four whiskies — two big Japanese producers and the only ones that export to the U.S.
Japanese distillers have tried to emulate Scotch whisky production, so the flavors are similar. But you’ll find that the whiskies from Japan are smoother and a tad sweeter than what you’ll get from Scotland.